Redevelopment agencies are designed by cities and counties to attract business investment through tax incentives and community revitalization. But amid a worsening budget crisis, Governor Brown is giving higher priority to “core” government services, such as education, than to redevelopment projects. At issue are two new laws signed by Brown in June. The first, AB 1×26, dissolves all redevelopment agencies in California and dedicates $1.7 billion of their funds toward resolving the state’s budget crisis. The second, AB 1x 27, establishes a statewide “voluntary redevelopment program,” which local agencies can join for a fee in order to continue work on their existing projects. The fee, called a “community remittance,” would be used to support school districts and county services that were heavily impacted by the state budget cuts. Since California Redevelopment Agencies are funded by property taxes, these community remittances would come from property taxes, as well. In Alameda County, 13 cents of every property tax dollar is earmarked for redevelopment agencies, according to the county assessor. Under the new law, a portion of that money would also support schools districts and various services. In Oakland, that amounts to about $40 million in the first year and $10 million every year after that. While it’s still unclear exactly how much of that money would go to OUSD, proponents say any new revenue stream would go a long way towards resolving some of district’s budget issues. But OUSD is unlikely to see any extra funding while the court determines the constitutionality of the governor’s plan. Shortly after Brown signed the plan into law last June, the California Redevelopment Association filed suit against the state on behalf of redevelopment agencies across California. The CRA, an organization that represents the interests of all 397 California redevelopment agencies, charges that both new laws violate Proposition 22, a constitutional amendment passed by voters in 2010 that prohibits the state from seizing local government funds. The Supreme Court subsequently stayed the measures and, on Thursday, heard oral arguments in the lawsuit in an expedited, one-hour hearing. Meanwhile, the California Teachers’ Association (CTA), a union representing public school teachers in California, addressed the court in support of the new redevelopment laws. In a phone interview after the hearing, CTA spokesperson Sandra Jackson argued that diverting money from redevelopment agencies would ease some of the financial constraints suffered by schools after repeated budget cuts—and might stave off future cutbacks. So far the prognosis doesn’t look good. According to a report released by State Controller John Chiang Thursday, October revenues were $810.5 million below projections for the month, and expenditures for the year are over budget projections by $1.7 million. The dissolution of redevelopment agencies is a key part of Brown’s budget plan for the coming year, as it would contribute much-needed funds to school districts and counties. If the court rules in favor of redevelopment agencies, the state will have to reconsider its budget strategy for the next few years. Conversely, if the court rules in favor of the state, redevelopment agencies will be faced with a tough choice: Disband, or hand over a big chunk of change in “voluntary” community remittances. “If [the court] determines that the two bills are constitutional, that is the law of the land and agencies will have to make their own determination of whether they’re going to continue in existence and make their voluntary payments,” said Jim Kennedy, the CRA’s interim executive director. For most redevelopment agencies in California, long-term survival is worth the financial burden of paying community remittances. According to survey information collected by CRA, about 90 percent of the state’s 397 redevelopment agencies are willing to make the necessary payments in order to stay in existence and see their projects through. Oakland’s Redevelopment Agency is no exception. After some initial hesitation, the City Council passed an ordinance in September authorizing the agency to make the required payments under the new laws, if they are upheld in court. “If both laws are upheld, we would definitely buy our way back into existence,” said Gregory Hunter, the deputy director of Oakland’s redevelopment agency. He acknowledged, however, that the $40 million payout required under the new laws would significantly limit the scope of the agency’s work and diminish its ability to attract private development to the city. 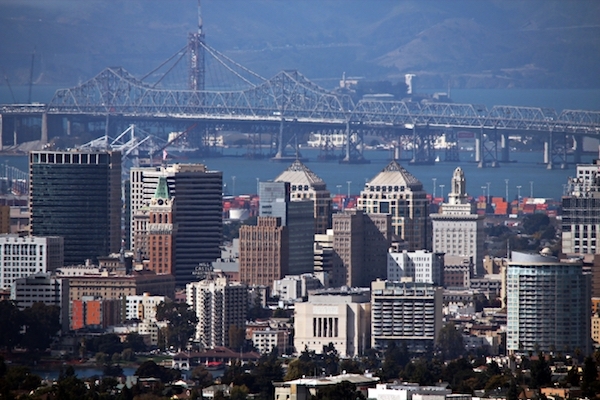 The agency has hundreds of open redevelopment projects in nine different project areas of Oakland, ranging from relatively small building improvement grants to multi-million dollar transportation projects. Though a sizable cash infusion could have a monumental impact on Oakland schools, the Oakland Unified School District has refrained from taking a formal position on the governor’s plan. The district’s spokesperson, Troy Flint, acknowledges that the issue is even more complex than it might appear on the surface. While additional funding would be welcome, he said, officials are skeptical about whether the redevelopment funds would supplement—rather than supplant—existing state funding for schools. “I don’t think anyone can assume any new funding stream would be supplemental or additive, given the way that funding for education has been stripped over the years,” Flint said. The impact of the new laws on local redevelopment efforts is also a concern for the school district, Flint said. But some community members argue that education and development aren’t mutually exclusive and can work in tandem to improve a community. Ehrenkrook said that, if the school district gets the money, he hopes it will be directed toward keeping small community schools, like his own, open. But Flint said he doubts any new funding stream would alter the school board’s decision about the school closures. The Supreme Court plans to rule on the case by January 15—before redevelopment agencies are set to begin their first payments to the state. The state Supreme Court heard oral arguments in a lawsuit challenging Gov. Brown’s plans to dissolve redevelopment agencies and divert their funds to school districts. Screenshot courtesy of Calchannel.com, from its webcast of the hearing on Thursday. Oakland’s fiscal house of cards would suffer a body blow if the State Supreme court rules in favor of Brown’s attack on the Redevelopment Agency tax scam. Oakland pols and bureaucrats piously speak of all the great economic development they have achieved and will achieve, and all the thousands of affordable housing that otherwise wouldn’t have been built without the diversion of real estate taxes to local RD Agencies. The very crux of the criticism leveled by non partisan good government organizations in CA is that most of the development and low income housing gains claimed by RDA’s would have happened without the RDA’s. Many of the projects should never have been funded in the first place. Another large piece of RDA money is siphoned off to pay for non redevelopment and alternative City overhead. Oakland is a prime example where something like half the budget of CEDA (building and zoning) is paid for by RDA under the guise of redevelopment. Many of the worst investment decisions made by Oakland were to lend RDA funds to shaky, politically connected developers, certain famous bakeries, and to pay for part of the Chiodo Creature in DTO. Oakland Mayor and Council considers RDA funds to be “other peoples’ money”, ie. a kind of monopoly money that can spent on any cool sounding project because it doesn’t come out of the General Fund and impact libraries, cops, pothole spending. Guess what happens when anyone thinks money is “free” ? They don’t look real hard at construction budgets, cost overruns, alternative uses. Look at massive cost overruns at the Fox Theater rehab as an example. Since Brown joined in the abuse of the RDA when he was mayor of Oakland, he knew firsthand what a scam the RDA are here in Oakland. Using some of that RDA money for human redevelopment by improving education for all kids, public and charter, would be hecka better investment than the way those funds have been wasted up to now. Would be informative to post a complete list of outstanding loans owed to RDA by developers and the current value of the underlying real estate. Similar list of loans that are co-signed or guarranteed by our RDA and whether they are underwater. Lastly, a list of properties that the RDA now owns because of defaults. How many are vacant and how many are at least breaking even after rents? Question: does the RDA own the huge Zhone building off 880? RDA trivia: to show that our Mayor and City Council treats the RDA as a cookie jar instead of as an irreplaceable source of capital for critical improvements and affordably built affordable housing, just look at how our City “balances” its budget by selling real estate at ridiculously inflated prices to the RDA. Council and Mayor did that with some fire dept training facility, and wants to do same with the Kaiser Memorial Center. Would be called a shell game if it were only Oakland doing that. Thanks again for the article post.Really looking forward to read more. Keep writing…. Quan lost that bet. No surprise since she’s usually wrong on predicting litigation outcomes. eg. she was wrong when the courts upheld the gang injunctions.